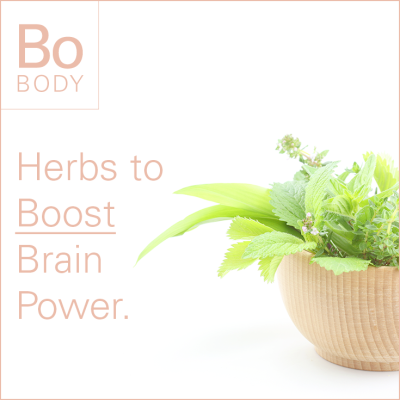 Herbs to Boost Brain Power. Your brain is a the motherboard of your body and the part of you that is responsible for every thought, move, motion or action that you make or take. Which means that you NEED to look after it. For your brain to be performing at its very best you need to ensure that it not only is well nourished but also that the circulation of blood and in turn oxygen is of the best speed and quality. But how can you take care of your brain? After all, it is not a part of the body that you can apply a lotion to. Well, the answer is easy; herbs. Herbs can help your brain when it’s overworked from the stress and strain of everyday life and the best thing of all is that they are readily available and can be used in combination of ways for the very best results. Here are some top tips for brain boosting herbs. The first three herbs on our list are common ones. Rosemary improves clarity and can rationalize emotions. Peppermint will boost your energy as well as providing a helping hand for creativity and language learning, and Basil is known to improve mental fatigue and to help you to focus when you are losing your way. Next on our list is Brahmi, an herb that not only rejuvenates the brain but also the nervous system too. It is vital in bringing together the left and right sides of the brain, making sure they work in harmony. It helps mental functioning in the sense that we can not only take in new information presented to us but also retain it too. It is also now to improve attention and focus, help our brains to withstand any emotional stress and reduce anxiety. Often consumed with Brahmi, Gotu Kola is a herb that can also help with brain functioning. It balances the brain and can also improve blood circulation and memory capacity too. It is also thought that Gotu Kola can help reduce stress levels, which in turn has a positive effect on the brain. Both of the above herbs are known to improve cognitive function. When used together they can really provide a boost to the cognitive abilities. Ginseng has actually been used as an alternative treatment for those who have neurological conditions such as ADHD and ADD. All of these herbs can have a positive impact on the function and performance of your brain. So why not see how they can help you by adding them into your health routine? Comments? Let's Dish About It Below. One Response to Herbs to Boost Brain Power. First off, I wish to thank you in the stellar together with educational entry. I’ll have to acknowledge which often, We havent noticed relating to this info. We have noticed quite a few new data with regard to cause. Thanks plenty for providing this particular efficient and interesting inormfation. We’re waiting pertaining to other exciting articles due to you against the nearest long run. Beauty Super Food Cheat Sheet.